Have questions? We'll Carreno tile has answers! The internal make-up of this membrane is such that movement in the concrete is not directly transferred to the tile. Although the membrane is bonded to the concrete and the tile to it, the membrane stretches where needed to prevent or reduce force transference. These membranes are either trowel applied or sheet applied. In many cases, multiple components or steps are part of the system. Can I bond tile to the black “cutback” residue left when old vinyl tiles were removed? Physically removing all coatings is the most reliable way to make sure you have an appropriate surface to which to bond tile but the old asphaltic (black) adhesives (often called “cut-back”) can be very difficult to remove. Typically, the “cut back” should be scraped smooth so the tile is not sitting on ridges of adhesive. Changing grout color is more commonly done but; again, the results are generally not as good as the original item. When the grout is new, has not been sealed, and the edge of the grout joint is neatly defined and when the adjoining tile surface is very smooth, sometimes good results can be achieved. However, if the grout is not porous (from sealer or dirt) or the adjoining tile is rough or absorptive, it may be impossible to get a satisfactory result. Cementitious grout, as you may have observed, is porous – it can absorb a stain. For this reason, many owners choose to seal their grout – usually the better the sealer, the more the grout joint is protected. Even better, if epoxy or urethane grout is used, it is virtually as stain proof as the tile. In some cases needing to re-grout is sometimes the result. For cementitious grout, there are two broad classes of sealer: penetrating sealer that chemically bonds with the grout and repels water (and water based stains) and topical sealers that coat the surface of the grout and repel almost everything (until they are worn off ). In general, the Topical Sealers are less expensive but give the grout a plastic appearance. Also, they are subject to wear and tear and very sensitive to water. The Penetrating Sealers are more expensive but also more durable. There are also penetrating sealers that repel oil based stains that are even more expensive. 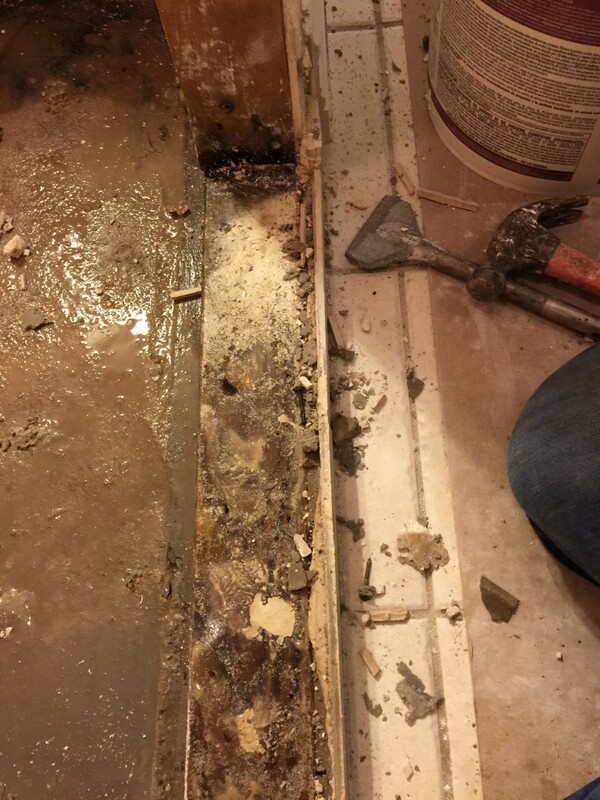 There are many things that can cause excessive deflection in your subfloor (and consequent cracking in the tile) or you may have a perfectly sound sub-floor but not have prepared the floor properly for tile. Is the sub-floor plywood over joists 16″ on center? Was the sub-floor screwed to the joists? Does the thin-set used match the conditions present (was a polymer additive used and if so was it appropriate for the sub-floor? Was the thin-set coverage satisfactory? What was the notch size of the trowel used? What causes cracked or loose grout? There are several things that can cause cracked grout. Excessive deflection in the substrate. This movement can cause the grout to crack, and if sufficiently severe, can cause tile to crack. Grout that is insufficiently packed into the joint. If insufficient force is used while grouting wall tile, it is easy to “bridge” the joint where the grout does not penetrate to the back of the joint. This is especially true if sanded grout is used in joints narrower than 1/8″. The sand grains can easily bridge a narrow joint – in this case the grout may be only on the surface and have little strength. Cement Grout made with an excessive amount of water or polymer additive. The liquid that goes into the grout ultimately must evaporate (except for that consumed by cement hydration). This evaporation can cause pinholing in the grout and a weak grout structure. Grout packed after cement hydration started. All cement based materials have a pot life. If water is added to the mix after the grout begins curing in the bucket, the grout will be sufficiently plastic to pack but will not cure into a hard homogeneous block – rather it will be crumbly and weak. This is a question is both easy to answer and difficult. Selecting the correct tile for the use and, of course, one you like. Layout the floor to avoid small cuts along walls or other transitions. Small cuts are hard to make and Does Not look good. If you are using several boxes of tile, make sure they are of the same caliber (size tolerance) and shade. Usually the boxes will be marked with a code to tell you this. Select the correct adhesive for the tile. Don’t try to save money on installation products. Use the ones recommended for the tile, type of substrate, and location. Wait the proper amount of time to let adhesive to before grouting (or walking on the tiles). These are just a few hints. This is really rather straightforward. “Overnight Installer” a installer who has no Knowledge (in product and materials), Quality or Craftsmanship , but has Experience (has done more than one project). Tile is bonded to a concrete slab. Why do I have cracks? Whenever tile is bonded to concrete, movement in the concrete will cause cracks to occur in the tile layer. Should cracks occur in the concrete, these cracks will “reflect” through the tile – this is often called “reflective cracking. Even small shrinkage cracks in concrete can be dimensionally active where continued curing of the slab will cause these cracks to expand or propagate. If this occurs, the cracks will show through the tile. This type of cracking can be easily avoided. By installing the tile over a crack isolation membrane using a thin-set method. Poor thinset coverage, thinset applied in “dabs,” thinset used beyond its pot life, or thinset that was disturbed as it was curing. As with all tile installations, the entire substrate below the tile is important – not only the layer to which the tile is bonded. Not all thin-sets are capable of bonding directly to tile. Mechanical or chemical abrasion to tile can release fine particles which could cause harm if inhaled or ingested. As with all tile installations, the entire sub-floor below the tile is important – not only the layer to which the tile is bonded.